Yesterday I had the pleasure to talk to Matt Carlson and Arnoud Van Houten of Sunnovations. Matt’s the business guy, and Arnoud is the inventor/technical guy. Their web site is www.sunnovations.com. I found their web site when I was scouring the web for references to the Copper Cricket. At first glance I thought, “these guys have stolen our technology.” Then, after a bit of thinking, I realized we hadn’t done anything with it for 15 years, the patents have expired, and this is actually what I wanted to see happen: I wanted someone to use the technology. Of course my next step was to see if they had patents. They did. I downloaded their patent describing their version of the geyser pump and studied it carefully. I was pleased to see that not only did the patent refer to our patents, but also to a trade article about our product. The drawings looked like our early prototypes with some minor additions, but after reading further, those little additions were huge. I was very impressed by the improvements they made. Their product is easier to install and will re-create its own vacuum. It doesn’t require a vacuum pump to create an initial vacuum; it uses non-toxic propylene glycol as the antifreeze, and can be installed with plastic tubing. It has novel over-heat protection that dumps the fluid out of the collection plate before reaching 180F. They use standard flat-plate collectors, and don’t worry about nucleation. We talked for about an hour and a half, mostly Van Houten and I exchanging ideas about the technology, and Carlson talking about their distribution channels. We also talked about how the Internet has changed the game. Remember, in 1995, the year Sage Advance went out of business, the Web wasn’t even public. When I compare the two systems, I think the Copper Cricket still has a few advantages. I believe they will find that the CC is more efficient when compared with their SRCC certification which is currently under testing. I think the CC’s pump rate is faster than Sunnovation’s. In the long term, I think the CC will have a longer life-expectancy if a side-arm heat-exchanger is used. I have anecdotal proof that the CC with a side-arm heat-exchanger can remain in perfect operation for over 20 years with out maintenance. When we discussed nucleation and boiling, Van Houten described the three types of boiling that they have seen: 1) fizzy boiling, where the fluid is full of bubbles as it is ejected from the lifter. This is what we saw when our early geyser pumps were starting up for the first time. It’s similar to when a pot of water is boiling. At first you see almost a complete coverage of the bottom of the pan with tiny bubbles. This type of boiling doesn’t pump fluid very effectively. 2) continuous slug pumping, where large slugs of hot fluid are ejected from the lifters. This is the optimum. I expect this is boiling that occurs at a few large nucleation sites along the tube a foot or so below the fluid level. A single bubble expands rapidly and drive hot fluid out of the lifter. 3) explosive boiling – we saw this type of boiling when we weren’t using nucleation tubes. When the early prototypes without nucleation ran for a week or so, the risers got really hot over 220F before they would discharge. When they did, they exploded with so much force that it rocked the collector stand. It is why we installed the evil check-valve in the faller (the pipe from the vapor condenser outlet to the footer manifold.) After adding the nucleating risers, we were able to remove the check valve. Today I figured out how to pry drawings out of my old MacBook and convert them to web friendly graphics. I still haven’t determined how to get them into a more current drafting program, but after revisiting them for the first time in 18 years, I don’t know if these graphics will be of much use. They describe the methods we used to manufacture Copper Crickets. I believe a version of the Copper Dragon will be more appropriate for the Do-it-yourself builder. You can find them in the Manuals/Docs link on the Web site. From 1980, when Eldon Haines and Ralph Bartera started working on the Geyser Pump, to 1995 no one else was able to make one work. Even though the patents were in the public domain and we had installed over 1000 systems throughout the US, and a few in Canada. The technology was widely publicized, in most home and building related magazines, Popular Science, and all of the solar trade rags. We attended many solar conferences, gave papers, moderated other sessions, and installed many commercial systems for the National Forest Service. We know that several of our competitors tried to replicate the technology, but were unable to make it work. I’ve blogged about this before. So, I started thinking about why they couldn’t do it. We had trade secrets. There were things that we didn’t talk about, even though everything was in the patents and articles that were written about us and the technology. The things we didn’t talk about were well hidden from the outside by a thick veil of perceived obscurity. This was not something that we created intentionally. It was something that manifested in the eyes of onlookers because of who we were. First of all, Dr. Eldon Haines was an actual ‘Rocket Scientist.’ He worked for JPL (NASA). He was a nuclear chemist. He invented a neutron spectrometer that went on Lunar and Mars missions. I was studying physics at the University of Oregon. We worked in obscurity, in Eldon’s and then my backyard, testing prototypes. We didn’t have many visitors. When interviewers asked us why we had no rivals, or when our dealers asked about why no one else could make geyser pumping work, we just mentioned that there were ‘trade secrets.’ In reality the only trade secret was that there were no trade secrets. There were some important proportion issues, like the size of some parts of the system related to other parts, but there really weren’t any profound secrets that would have kept anyone from building their own geyser pumping system. The only thing that I can think of that may have stymied the attempts was that the system had to be perfectly hermetically sealed. It has to be built with the perfection of a refrigeration system. Any leak, no matter how small, will eventually kill the geyser pump effect, unless you’re running the system at atmospheric pressure and replacing any fluid lost to evaporation. I think most attempts were abandoned because of the belief that there were trade secrets that only someone with advanced scientific knowledge would be able to fathom. If we had been two backyard yokels, with some plumbing ability, no one would have doubted their own ability to plagiarize our technology, but because there was the perception that we were brainy guys, others chalked up their failure to replicate a geyser pump to our propinquity to advanced knowledge. The dominant reason we were able to make a geyser pump work was that we learned how to silver braze the non-sweatable fittings, and that we removed the sight-glasses and flow-meters that were prone to leaking. Once the system was sealed we discovered that after a week or so of working the boiling surfaces in the riser tubes had lost their ability to nucleate bubbles and the system over-heated. We worked on that problem for quite awhile, but eventually solved it, and patented the solution. 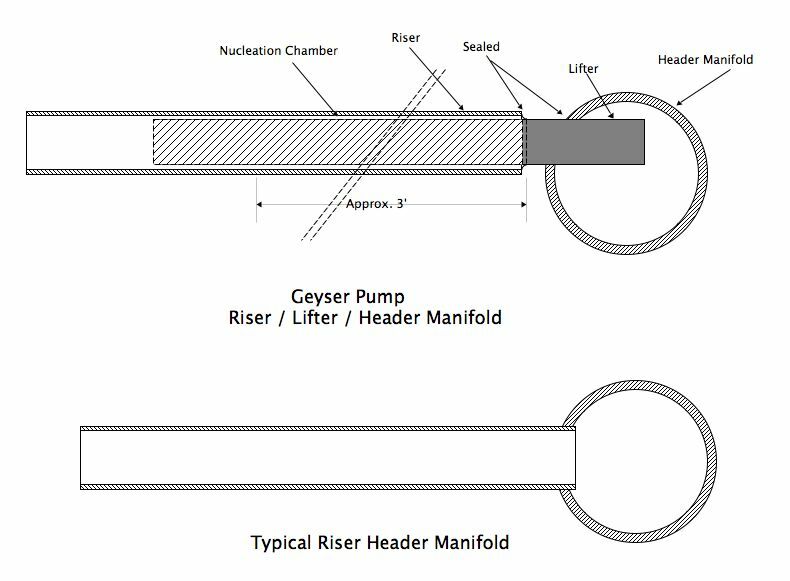 Solution was the insertion of a slightly smaller diameter tube into the riser tubes creating a self-regenerating nucleation annulus between the inner and outer tubes. This still remains an enigma to us, but it worked so it became a fixture in the production models. I still wonder if it’s necessary or if we solved a problem that didn’t really exist. In any event, just the perception was enough to obfuscate the simplicity of the technology. Last week, I was on a familiar road in Springfield, Oregon and remembered that a friend had installed one of our early prototypes there, on his home. I glanced through the trees and saw the back of the system on his roof. Today I looked at my contact list in my phone and found his number. I haven’t talked to him for at least 10 and maybe 20 years. I called the number. A woman answered, and I asked, “Nancy?”. She said yes. We started talking, and she immediately remembered me and said, “we think of you every time the sun is out and we’re enjoying our free hot water.” I told her that’s why I was calling and told her about what I’m doing with this web site. Then I talked to Dan, her husband and he started telling me how wonderful the system has been, and that he had had a leak in one of our experimental fittings about 10 years back, and he was able to fix it himself and recharge the system. He said it hasn’t working at the optimum level since then, but they are still able to turn off the breaker to their electric water heater in May and turn it back on in September or October. They invited me over to take some photos, and I took the opportunity today to ride over on my scooter because it’s supposed to rain here for the next 6 days. This system was installed in 1987, the year we started Sage Advance. These collectors started out with internal vapor condensers made of 1″ copper pipe the width of the collectors. We realized that in hot weather, the density of the solar fluid expanded enough to fill the vapor condenser and then stop the system. We just capped off the internal VC and installed an external VC made of 3″ copper pipe. This is the external vapor condenser. Notice the capped off 1″ pipes protruding from the collector box at the same level as the top of the external vapor condenser. Those are the defunct internal vapor condensers. Also notice the drain port in the top of the 3″ copper cap facing the camera. That’s the resting fluid level in the system. That drain should probably be about 1/2″ from the bottom of the cap. I’m surprised that this system operates at all. When the weather here improves, I’ve promised to help Dan modify and restart his system. We should be able to get the Delta-T down to less than 20 degrees F.
Before we realized the solution to the bubble nucleation problem, we could only get the earlier prototypes to operate by using a check valve. Without bubble nucleation the boiling was so violent that it would drive the cold water back up the faller, so we put in a check valve. We HATED the check valve. It was our only moving part. Therefore, it was evil. This one is still working, but I still hate it and vow to remove it when I help Dan modify the system. I’ve been thinking about the many people who say they would like to build their own Cricket or Dragon system. When people asked me about this when we were manufacturing and selling systems, my feeling was that it was too complex to do. Several of our competitors in the industry at that time tried to build their own (without our assistance) and failed to get them to work. One even hired one of our installers to troubleshoot their plagiarized system. But now, that I’m back at the basics stage, I think building system similar to our early prototypes would be a fairly simple thing to do. This weekend I happened to drive by one that we installed in 1985. I saw that it was still on the roof . . I just called the owner. He answered the phone number that I had for him 30 years ago. His system is still working. I’m on my way over there right now to take some photos. It’s not often that you see coverage of a failed solar heating system in the newspaper. Usually they just die quietly, but in today’s Register Guard was a story about the 18-month-old Lane Community College solar water heater that was damaged when the temperatures got down to 23 degrees F.
Sorry Dave, but solar water heating is not new, and Eugene, Oregon freezes every year. If you create a system with the potential to fail, it will. I guess the good news is that they think only 18 of the 36 panels were broken. In my view this was not a catastrophic failure. This failure only killed the collector panels. A catastrophic failure would have burst pressurized water lines in the attic space and flooded the wood floors in the new gymnasium for 4 days. Too bad they didn’t have access to the Copper Dragon. Almost everyone I talk to about the Cricket and this site asks why I am doing it. “Are you trying to make a business out of it,” (especially my wife). My answer has been, “I’m not sure.” I just know that the most fun I’ve ever had, and the most rewarding (and lowest paying) career had been the development of this technology. Over the past 15 years I have been developing Web sites for companies, and I’ve marveled at the Open Source Community. I think Open Source may be a good model for pursuing this project. I have set up an appointment with a friend who has some old Macs and the drafting software we used to create all of our shop drawings and other graphics. I’ll be posting those as soon as I convert them. This will show what we did for production, but I think there is a different market out there for this technology: the do-it-yourselfer. To that end I’ll be trying to put together a design closer to the Copper Dragon that uses flat plate collectors and external vapor condensers. The only modification we made to the Dragon plates was the insertion of about 3′ of tubing down into the risers that was also inserted up into the header. The Nucleation Chamber is where the magic happens. It took several years for us to discover the reason our geyser pumps only worked for a week or so. It is because geyser pumping requires the creation of steam bubbles, and after a few days all of the nucleation sites for the bubbles had emptied. Without the nucleation sites, no bubbles would form, and no pumping would occur until the riser wall reached a high enough temperature to flash boil. The nucleation chamber traps steam and deposits a bubble into the super heated liquid at the bottom of the annulus, causing it to expand and pump the hot liquid above it into the header manifold. See the Bubble Nucleation patent. I traded e-mail with Randy Brooks from Chelan, Washington yesterday. Here’s his note about the Cricket and some photos of his own system. It’s great to meet you and see you resurrecting the Copper Cricket! I bought my Copper Cricket in the early ’90s and installed it on the roof of my passive solar home in ’96. But I left it covered and unactivated until I moved into the house full time in 2000. I wanted to be sure I could monitor it’s operation. It’s worked perfectly ever since! We turn off the circuit breaker for the hot water heater in May and leave it off until October, using only solar hot water. From October to May we are happy to get whatever solar input we can. Originally I used the dip tube supplied with the installation kit, but found that having only one electrical element working in winter meant we sometimes had just warm “hot” water. Last fall our tank started to leak around the dip tube entry, after 16 years, and we replaced it with a stock, two element, electric hot water tank. This time I didn’t use the dip tube and just plumbed the thermosiphon loop from the tank drain to the Solar Pad, then back up to temperature/pressure relief valve location on the upper side. I moved the TPR valve to the top where there was an extra hole for it. We’ll see this summer if this arrangement works as well as the original. Since 2000 our company, Brooks Solar Inc, has offered Copper Cricket owners copies of my installation and owners manuals for the cost of copying and mailing. I’ve been contacted by at least a hundred Copper Cricket owners over the years and have travelled as far as the southern Sierras to help get Copper Crickets back on line again. 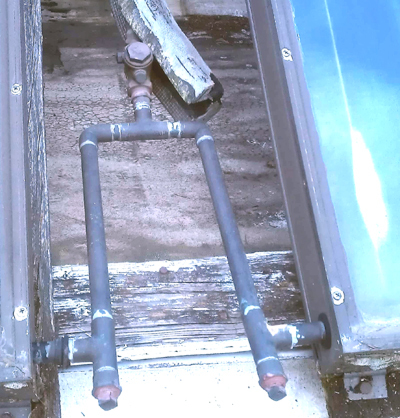 Many owners have reported flawless operation for 10 years or more, before having to reroof or replace a hot water tank. 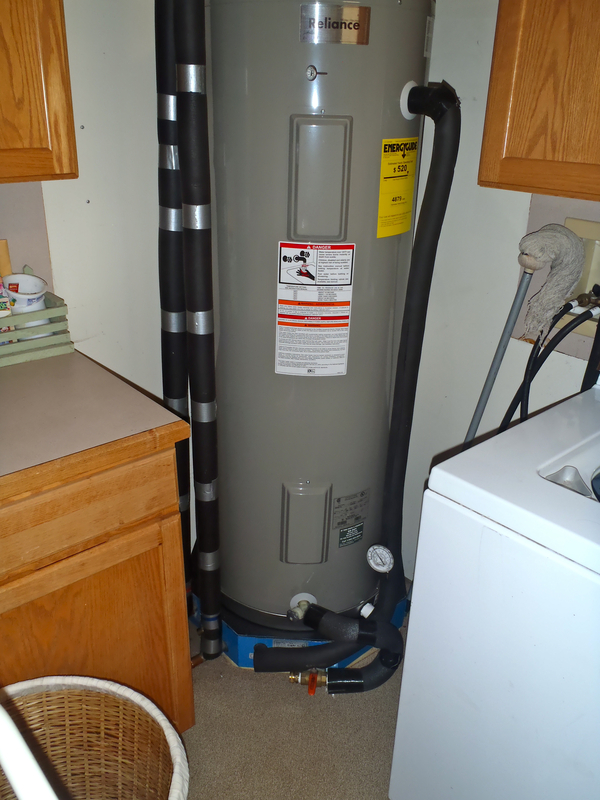 The most common problem is when people replace the hot water tank without first covering the collector. The collector overheats, melts the fuse plug, the methanol evaporates, and the system stops working. I tell owners where to get a new fuse plug (HVAC suppliers) and methanol (racing shops, where it’s available in small quantities as fuel) and offer to send copies of my manuals and a list of installation kit items. I also refer people to the closest knowledgeable person (Solar Assist in Eugene, and Mr. Sun Solar in Portland). I would suggest you list knowledgeable service people on your web site. I will certainly refer people to your site. Feel free to list me on your site. I looked over your web site and it’s great to see the information there. I think there is a missed link though – the “Owners and Installation Manual for 1B and 2B” links to the Oregon magazine article, not the manuals. Offering spare parts and do-it-yourself plans on your site would be great. Many existing owners also don’t have the installation kit, so selling or renting a kit would be helpful. 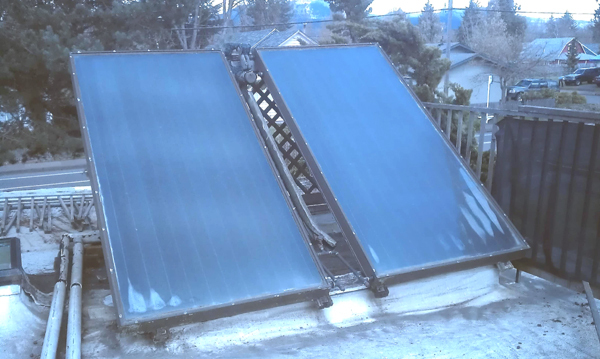 In the last 12 years of installing renewable energy systems I’ve tried to find the simplest and most reliable solar hot water systems for freezing climates. I’ve never found anything that compares to the Copper Cricket. I avoid glycol systems because the collector loop is pressurized and the glycol should be tested every 3 to 5 years and replaced if it’s no long pH neutral. No one ever does this and after 10 years the copper pipes begin developing pin hole leaks and the system fails. Since Copper Crickets are no longer available, I usually recommend drain back systems (AETSolar.com makes a nice retrofit kit to attach to an existing standard hot water tank) as the most reliable. These systems use distilled water in a non-pressurized collector loop that drains back to a small tank inside to prevent freezing or boiling. I have a drain back system myself and it works fine, but has two small pumps and a controller, and makes pumping and gurgling noises. The simplicity and reliability of the Copper Cricket, with no moving parts, no energy input except solar, and virtually silent, can’t be beat by any currently manufactured system that will work in freezing climates. Attached is a photo of our system, including the new tank and thermosiphon loop. 1. Cover the collector with a tarp. 3. Check the fuse plug and replace if needed, using high heat Permatex sealer. 4. 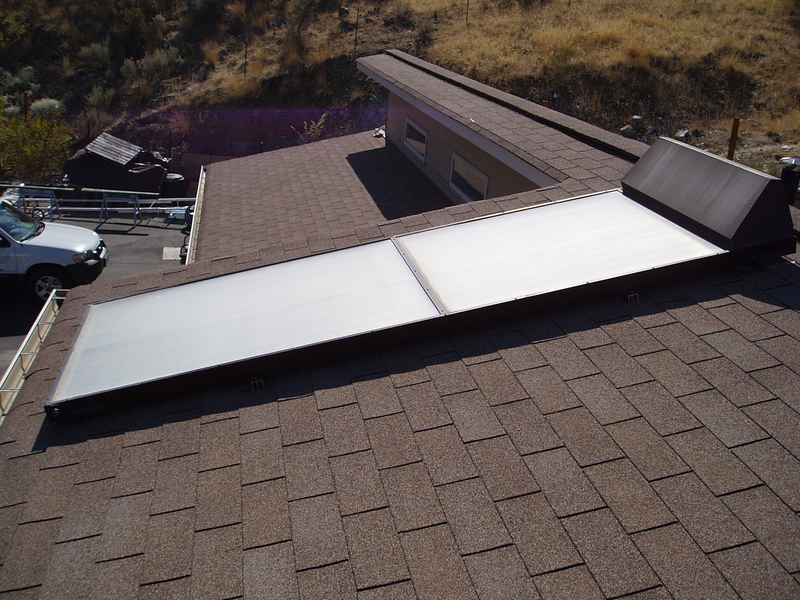 Connect a domestic water supply to the drain of the collector loop at the solar pad, open the collector drain on the roof, and flush the system until clear water is flowing out the collector. 6. Drain the water from the collector loop and collector, and replace plugs at drain locations, using high heat Permatex. 7. Mix 1 gallon methanol with 4 gallons distilled water in an enclosed container (I still have the 5 gallon plastic bag that came with the installation kit) and fill the collector loop by pouring the solution in the fill port, per the installation manual. 8. After draining air and refilling, per the manual, attach the vacuum pump and evacuate the collector loop, again per the manual. 9. If the system holds vacuum, remove the vacuum pump and remove the collector cover. 10. If there is sun, check the temp at the solar pad to see if the system is “pumping”. If the system site has “hard” water, I also recommend the owner flush and descale the domestic water side of the solar pad. I was surprised to find an e-mail about the Cricket the morning after I activated this web site, and from Bulgaria. The next day, another from a man in Bend. In addition to these two, several people in Eugene have asked me about building their own. At first I thought this might be a pretty arduous task, but then I remembered that we built all of the prototypes in Eldon’s and my backyards. I think it shouldn’t be too hard to write a set of plans for do-it-yourselfers. I have seen a lot of plans and instructions online for building fin-tubes or attaching copper plates to copper tubing. There are also some good instructions on building insulated boxes. I suppose just giving a set of parameters for sizing and our reasons for choosing what we did would be a good start.
. . . after writing this I thought about sourcing some components to start building prototypes for do-it-yourself geyser pump plans. I sent a request to Sun Ray Solar, manufacturer of solar collector fin tubes. It seems to me that the trickiest part of building solar panels is bonding the tubes to the plates. Sun Ray Solar’s tubes use a unique way of physically clamping the fin to the tube, by doing so they can use aluminum fins and copper tubes. If they send me some samples I intend to build a 2-tube collector to test the pump function using the 1/2″O.D. tubes. The Copper Crickets sitting on saw horses in my front yard are a constant reminder to me that I need to get them back on the roof and hooked up. I left the solar industry in 1996 after being fired from my post as president at Sage Advance Corporation. Honestly, it took awhile for the pain of that experience to melt away and let me appreciate the wonderful and enlightening 13 years I spent until that point leading the development of the Copper Cricket and its marketing. Several people over the past few years have contacted me about the Copper Cricket. Some were interested in starting up another manufacturing company; some have Crickets and just wanted to tell me how well they’re working. Some have obtained abandoned Crickets and want to know how to make them work on their homes. 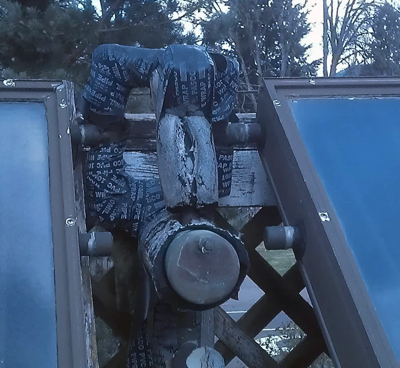 When it was in production, the Copper Cricket had little competition for the best solar water heater in the world. It was made to last in excess of 50 years without more than an annual flushing of the storage tank and heat-exchanger. It had no pumps, controllers, electronics, or moving parts. It was a little more expensive, and the installation required attention to detail and perfect plumbing connections. In a word, it was cool. Today, there are more choices for solar water heaters, and the electronics are much more reliable. PV pumped systems, using a small photovoltaic panel and an inexpensive pump seem to be the optimum solution. Even the current systems have their problems. Solar water heating remains unsexy in marketing parlance. It’s just not as flashy as creating electricity for battery-powered cars. People don’t think much about the cost of heating water in their homes, and even the most efficient solar water heaters won’t produce 100% of demand except in a few southern climes. There are still people who want solar water heaters. There are some niche markets where the Copper Cricket is by far the best choice. My hope is that I can make all of the technical and anecdotal information about the Copper Cricket available on this site, so that those who want to build new or fix existing systems will have a good place to start.